2016 finds Fanfare Ciocarlia celebrating their twentieth anniversary. What better way for the world’s premier gypsy brass band to celebrate such an important anniversary, than with their first new album since 2013? Fanfare will release their new album Onwards to Mars! on 22nd April 2016, on Asphalt Tango Records. Onwards to Mars! is crammed full of Fanfare Ciocarlia’s trademark Balkan party sounds. Blues and Latin influenced tracks, are given a big band makeover by Fanfare Ciocarlia on an album that was recorded in three countries on two continents. This included the Romanian capital Bucharest, and Zece Prăjini a small village in North East Romania. Zece Prăjini was where the Fanfare Ciocarlia story began,in 1996. Since then, Fanfare Ciocarlia have recorded eight albums, and have taken the world by storm. Two years after Fanfare Ciocarlia were formed, they released their debut album Radio Pașcani in 1998, It was a recording of a radio broadcast for Radio Pascani. Given the response to their debut album, Fanfare Ciocarlia released their sophomore album Baro Biao: World Wide Wedding in 1999. By then, Fanfare Ciocarlia were constantly touring, and their Balkan party sound was reaching an even wider audience. Given their gruelling touring schedule, another two years passed before Fanfare Ciocarlia was released Iag Bari in 2001. It became the most successful album of Fanfare Ciocarlia’s five year career. They had come a long way in the space of just five years. However, four years would pass before Fanfare Ciocarlia returned with their fourth album. Between 2001 and 2005, Fanfare Ciocarlia toured far and wide. They played everywhere from clubs to festivals, and were established a reputation as a popular live act. Still, though, Fanfare Ciocarlia found time to record a new album, Gili Garabdi-Ancient Secrets Of Gypsy Brass. It was their fourth album, but first for their new label Asphalt Tango Records. When Gili Garabdi-Ancient Secrets Of Gypsy Brass was released in 2005, it marked the start of a relationship that’s still going strong eleven years later. There was just a gap of two years before Fanfare Ciocarlia released a new album, Queens and Kings in 2007. It was well received upon its release, and was regarded as one of Fanfare Ciocarlia’s finest and most successful albums. All Fanfare Ciocarlia’s touring was paying off. Given how much of their time was spent playing live, it seemed apt that Fanfare Ciocarlia’s next album was a live album. Live was a CD and DVD set released in 2009, and featured a recording of their concert at the Kesselhaus Der Kulturbrauerei, in Berlin, April 4th 2004. On the accompanying DVD, entitled Gypsy Brass Legends-The Story Of The Band, there was a film of the concert, and the film Iag Bari-Brass On Fire. It told the story of Fanfare Ciocarlia’s journey so far. Although they had come a long way, they weren’t finished yet. Fanfare Ciocarlia next two albums were collaborations. The first was Balkan Brass Battle in 2011. It found two of the top Balkan brass bands going toe-to-toe musically. Boban and Marko Marković Orchestra Versus Fanfare Ciocărlia was indeed a Balkan Brass Battle. Musically, it was a battle royal, with Fanfare Ciocarlia stealing the show. Their second collaboration came two years later. Devil’s Tale was released in 2013, and was a collaboration between Adrian Raso and Fanfare Ciocărlia. Devil’s Tale was well received by critics, and found an audience not just in Europe, but further afield. Since then, the twelve piece band have been touring Asia, Oceania, USA and Europe. Fanfare Ciocarlia have been doing this again recently. In anticipation of the release of Onwards To Mars!, Fanfare Ciocarlia headed out on tour in March 2016 touring Asia, Oceania, USA and Europe. By the time Onwards To Mars! is released on April 22nd, this gruelling tour will almost be over. The tour has been publicising Onwards To Mars!, which was recorded in Romania, Germany and Colombia. When recording of Onwards To Mars! began, Fanfare Ciocarlia’s lineup featured Costică “Cimai” Trifan and Rădulescu Lazăr, who both play trumpet and share vocals. They’re joined by trumpeter Paul Marian Bulgaru; alto saxophonist Daniel Ivancea; while Oprică Ivancea switched between clarinet and alto saxophone. Constantin “Șulo” Călin plays tenor horn; Laurențiu Mihai Ivancea baritone horn and Constantin “Pînca” Cântea and Monel “Gutzel” Trifan play tuba. Completing the lineup of Fanfare Ciocarlia were percussionist Nicolae Ionița and Costel “Gisniac” Ursu, who played the large drum. However, joining Fanfare Ciocarlia were a few friends. This included vocalist Iulian Canaf; drummer Kai Schönburg; trumpeter Maite Hontel;percussionist Michael Metzer and Vladut Ivancea on clarinet. They final guest artist was Koby Israelite, who wrote and produced seven songs on Onwards To Mars. He also played drums, percussion and accordion. Gradually, Onwards To Mars took shape. Recording of Onwards To Mars! took place at four different locations. Some of the recording took place in Fanfare Ciocarlia’s hometown of Zece Prăjini. Other sessions in Romania took place at UNDA Recording in Bucharest. Fanfare Ciocarlia also recorded at Popschutz Studio, in Berlin and in Medellin, Columbia at Merlin Producciones. At the four locations, Fanfare Ciocarlia and friends recorded a truly genre-melting album. It mixed the old and new, and saw familiar songs given a new twist. Onwards To Mars! features fourteen tracks, including seven penned by one of the guest artists Koby Israelite. This includes the album opener Crayfish Hora. It finds Fanfare Ciocarlia adding punchy harmonies that accompany the lead vocal. Then when a sultry alto saxophone enters, and the arrangement begins to sound as if it was recorded in New Orleans, rather than Berlin, Bucharest or Medellin. It’s joyous, irresistible and dance-floor friendly. So eventually does Mista Lobaloba. It’s a slow burner, with an introduction that’s wistful and mournful. That’s until the arrangement explodes into life, amidst blazing horns, hollers and percussion. From there, Fanfare Ciocarlia kick loose, as the track becomes a slice of dance-floor friendly Cumbia. By then, a familiar track has taken on new life and meaning. 3 Romanians and Out To Lounge are two more songs from the pen of Koby Israelite. Both are horn driven instrumentals. The only difference is that 3 Romanians bursts into life, while Out To Lounge is a slightly slower almost cinematic sounding track. However, both tracks feature Fanfare Ciocarlia showcasing their trademark Balkan party sound. At the heart of the track’s success are a myriad of percussion, drums and of course, blazing horns aplenty. It’s an irresistible sound that will get any party started. Trenul, Masina Mica is one of two traditional Romanian songs on Onwards To Mars! Both are delivered by Radulescu Lazar, one of Fanfare Ciocarlia’s elder statesmen. On Trenul Masina Mica, he delivers a heart wrenching vocal against an arrangement dominated by horns. This proves a potent and emotive combination. Un Tzigan Avea O Casa is a much more uptempo, joyous and celebratory sounding track. Again, Radulescu Lazar takes charge of the vocal, and plays his part in reinventing this traditional Romanian song. Another traditional song is Doina Pentru Un Frant Inima, a wistful sounding Balkan blues. Its mournful, ruminative sound is quite beautiful. So is The Patron’s Funeral, another wistful sounding track that paints pictures of the rural Romania of yesteryear. Just like Doina Pentru Un Frant Inima, The Patron’s Funeral show another side to Fanfare Ciocarlia. One of Screamin’ Jay Hawkins’ best known tracks was I Put A Spell On You. It’s regarded as a genre classic, and it seems, is a favourite of Fanfare Ciocarlia. With the help of vocalist Iulian Canaf they reinvent the track. The arrangement is slow, dramatic and theatrical. That also describes Iulian Canaf’s vocal. Accompanied by horns, there’s a element of theatre to this Roma inspired cover version. Again, Fanfare Ciocarlia take an old song, and reinvent it, turning it into something very different to it once was. Cucuritza is another of the tracks written by Koby Israelite. It’s another dance-floor friendly instrumental, that allows Fanfare Ciocarlia to showcase their irresistible Balkan party sound. Fanfare Ciocarlia is a joy to behold, and something everyone should experience once. Another cover version is Bunica Bate Toba, which originally, was made famous by Moldovian rock band Zdob Si Zdub. Fanfare Ciocarlia totally transform this familiar track, and in the process, show just why they’re regraded as the world’s premier gypsy brass band. They unleash one of their best performances during a track which has a much more traditional sound, than some of those written by Koby Israelite. Talking of Koby Israelite, he contributes another two instrumental tracks to Onwards To Mars! The first is Saints and Dates, which features the founding fathers of the Balkan Beat at their very best. Seamlessly they combine the old and new, on a truly irresistible and joyous sounding track. Hora Strengarilor picks up where Saints and Dates left off. The pounding drums have a contemporary sound, before the scorching horns take over centre-stage. They bring back memories of another musical age, which is kept alive by Fanfare Ciocarlia. Closing Onwards To Mars is a cover version of Lucho Bermudez’s, Fiesta de Negritos’. It was recorded in Medellín with cumbia group Puerto Candelaria. Together, they create a track that veers between melancholy to dramatic, theatrical and joyous. It’s also a collaboration guaranteed to fill a dance-floor. 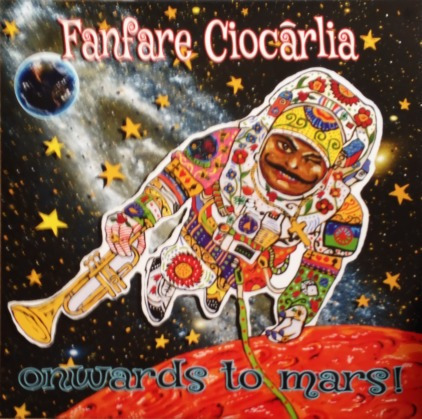 What better way for Fanfare Ciocarlia to celebrate their twentieth anniversary than with a new album, Onwards To Mars! It’s their first album since Devil’s Tale in 2013. Onwards To Mars! is also a reminder of why Fanfare Ciocarlia are regarded as the world’s premier gypsy brass band. They’re a truly talented band who seamlessly combine and flit between Balkan blues and cumbia to jazz and Latin on Onwards To Mars! It will be released on 22nd April 2016, on Asphalt Tango Records, and is without doubt the finest album of Fanfare Ciocarlia’s twenty year career. No wonder. The music on Onwards To Mars! veers between melancholy, mournful and wistful to dramatic and theatrical to celebratory and joyous. It’s also beautiful and heart-wrenching. Other times, the music is dance-floor friendly and truly irresistible. This makes Onwards To Mars! the perfect introduction to newcomers to Fanfare Ciocarlia’s music. Quite simply, Onwards To Mars! is an emotional roller coaster, where Fanfare Ciocarlia takes the listener on a musical journey that they’ll never forget. ← JOHN MARTYN-GRACE AND DANGER-VINYL EDITION.